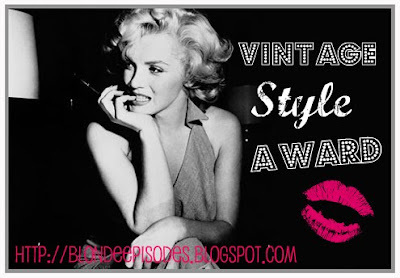 Firstly, I'd like to thank the darling Jessica of Chronically Vintage for her very own award. This one comes with a set of questions to be answered with one word only! Now, I know it's not in the spirit of this sort of thing (and certainly not in the spirit of the festive season) but it took me so long to get around to actually doing this that if I tried to pick people to pass it along to, it would never get done. I'd love to see anyone else do the questions, though! 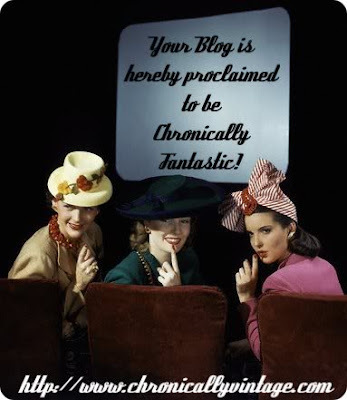 Hi Andi honey, thank you very, very much for blogging about my homemade award, I'm so touched that you enjoyed it! Many congrats on all your accolades, they are greatly deserved! Have a gorgeous Wednesday, sweet friend! Baroness: Thanks. =] Yes, so true.